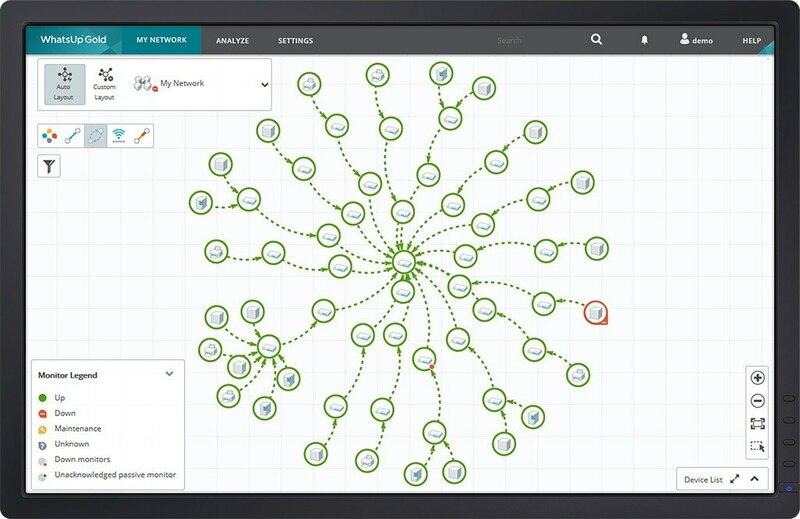 Network mapping software enables the visualization of network device connectivity and logical network structure. Network mapping is the process of discovering the devices connected to a network and how they are interconnected. In the strictest sense, network mapping is purely the portrayal of interconnectivity and should not be confused with network device discovery which delves into the physical characteristics of network attached devices. In a practical sense, however, mapping a large complex network is nearly impossible without first discovering the attached devices. The process is much simplified by using a tool that integrates the automatic discovery of networked devices with the mapping of their interconnectivity. Integrated network discovery and mapping tools use a variety of discovery techniques including SNMP, IP address range scans, Virtual Management Infrastructure, ARP, SSH etc. While layer 3 maps provide better visualization, OS and software information, port-to-port connectivity information is also required for diagnostics. Layer 3 maps can spot a problem, but to know exactly which connection caused the problem, Layer 2 maps are necessary. Network maps are critical in fault isolation and inventory processes. The more sophisticated the mapping the easier these processes become. Interface-level, port-to-port device connectivity is required to trace the location of a problem within a malfunctioning device identified by a Layer 3 map. This is achieved by Layer 2 mapping techniques. By correlating both Layer 2 and Layer 3 data, the network mapping solution can provide an integrated map that shows comprehensive IP and device connectivity. Maps and discovery tools can even detect downstream dependencies that allow alarm suppression. For instance, if a router fails then devices downstream from the router (from the perspective of the ping or poll device) will register as unavailable on the monitoring screen and will trigger alerts. Such scenarios can result in confusing alert storms and delay the fault isolation process. Modern discovery tools often either automatically detect such dependencies or allow the user to easily create them thereby suppressing downstream alerts. WhatsUp Gold’s discovery and mapping tool combines Layer 2 and Layer 3 discovery methods to create comprehensive, interactive network that are easily customized. It discovers and collects information from every network asset – routers, bridges, switches, firewalls, workstations and physical/ virtual servers using layer 2 and layer 3 discovery techniques, including SNMP, ARP, ICMP, Virtual Infrastructure Management, IP addressing, LLDP, etc. WhatsUp Gold then creates dynamic layer 2 and layer 3 maps, allowing administrators an integrated, real-time view of IP and device connectivity, non-contiguous subnets, VLAN connectivity and Virtualized domains. 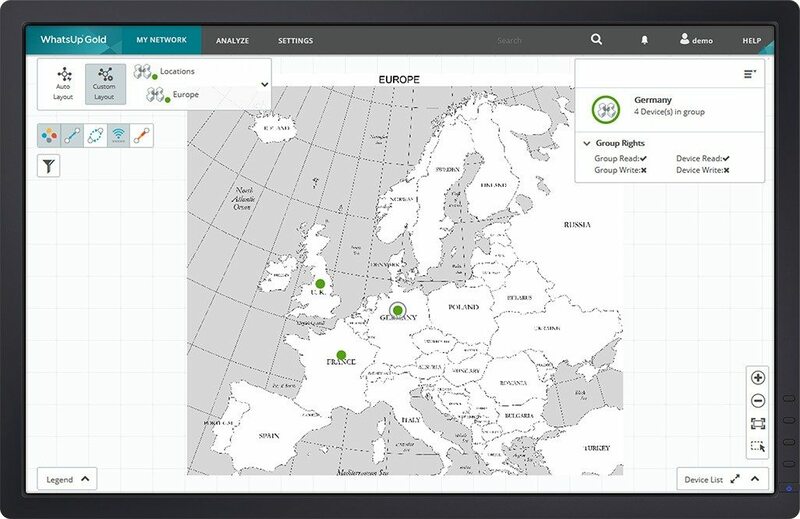 The maps can display the topology in spoke/hierarchical/ custom views; display device details and correlation between the device and its monitors/ alerts. Network mapping tools are essential to any admin’s network environment in terms of keeping track of not only everything that’s deployed on your network, but making sure you have an up-to-date picture of your network at all times to speed troubleshooting. In addition, network mapping tools provide the basis of compliance regulations including PCI DSS, which require an up-to-date network topology map. 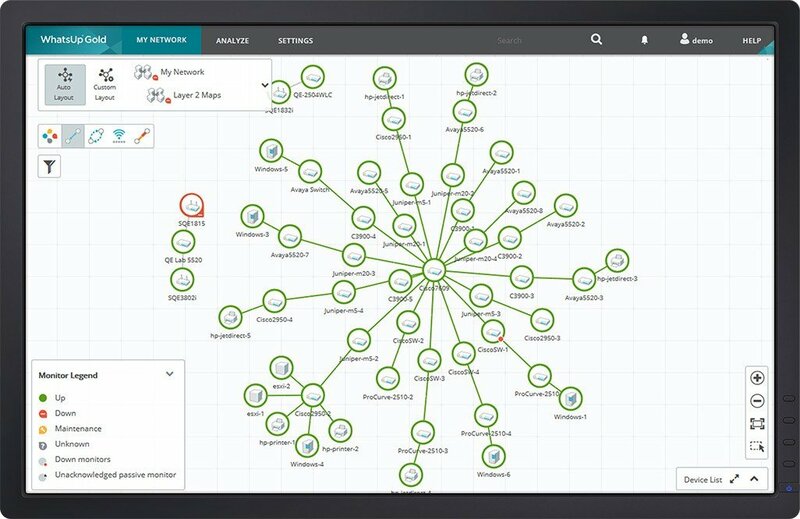 Most importantly, network mapping tools are simply the only way you can truly visualize your network infrastructure. Ideal network mapping tools give an IT manager an up-to-date view of the entire network topology, even as the network scales or changes in scope. In addition, network mapping tools should automate this entire process – from discovery, to mapping and tracking, to inventory and documentation of all of your IT assets across your entire infrastructure – to cut down on the time to resolution of issues. WhatsUp Gold does this and more across your entire physical and virtual infrastructures – from servers, deployed software, and network devices to VMs – documenting down to the level of port-to-port connectivity in a matter of minutes, so you don’t have to spend hours rummaging around in the wiring closet. In addition, you’ll also be able to export your network maps to Microsoft Visio and share with the rest of your team. WhatsUp Gold’s topology maps can also be customized to your heart’s content – in hierarchical or spoke formats, or custom views. View your maps any way that’s best for your team. You can even add your own background images to custom maps. Microsoft Visio, combined with a comprehensive network mapping tool, can be used for better documentation and inter-departmental communication. Since Microsoft Visio diagrams are used across an organization, chances are that it would already be on the enterprise’s software roster. This makes Visio an ideal choice to display maps to departments outside the network management team. Visio Network Maps can be great tools for providing auditors proof of compliance for SOX, PCI, HIPAA, FISMA and more. Microsoft Visio is the predominant network mapping tool, and has become almost synonymous with network diagrams. Visio’s ubiquity makes it easy to share network diagrams within and between organizations. But for network managers, the main drawback of Visio is the absence of a network auto-discovery feature. Hence, Visio is not a replacement for an integrated network discovery and mapping tool like WhatsUp Gold. Additionally, Ipswitch WhatsConnected auto-generates topology diagrams with full visibility into layer 2 and layer 3 connectivity, which can be printed, saved, shared, and exported to Visio, pdf, Excel or CSV formats in just one click. By combining the powerful discovery, inventory and mapping capabilities of WhatsConnected (including hardware and software assets, physical to virtual mapping, patch levels visibility, automated updates and more) with a simple one-click export to Visio, you get the best of both worlds. Learn more about Ipswitch WhatsConnected. Modern networks have so many network devices, virtual domains, mobile elements and device interdependencies that the only way to comprehensively visualize them for monitoring and troubleshooting is to make network maps. Network management solutions can make network maps using protocols such as SNMP, ARP, SSH, ICMP, Ping and Telnet. But to manage complex networks, administrators need more than one-time, static network maps. As mobile computing and VLANs dynamically change networks, network maps should automatically update to reflect network changes. Most network management software requires a defined “seed scope” – a range of addresses defining the network to be discovered. The network mapping software then starts off by discovering the device, identifying it and then collecting device-related information. This data is then used to make a network map. Advanced network management map elements generally contain Smart objects, which can store data and can be updated either during user-defined scanning intervals or when the network changes. A comprehensive view of complex networks is essential to maintain optimum perf romance and ensure 24/7 uptime and a network topology map can provide this. By visualizing the network’s devices, their interconnections, location and interdependencies, administrators can monitor network devices, proactively identify failures/bottlenecks, and reduce MTTR (Meantime to Repair), thereby ensuring better performance and business continuity. Moreover, a detailed topology map is now essential for complying with regulations like SOX, PCI, HIPAA, FISMA and more. WhatsUp Gold provides a fully-integrated network discovery, mapping and monitoring tool for your entire networked infrastructure.